Oil of frankincense, incense, charcoal, goblet of wine or beer, fruit juice, or water, two white candles, a statue or picture of Isis. Wear a white robe and tie a red cord around your waist. This will be in respect of Isis, whom you will be invoking. Anoint wrists, temples, and throat with oil of frankincense. Light candles. Prepare charcoal and add incense as required. Fill goblet with liquid, raise it in salutation to the Goddess, and place it back on your altar. Sit comfortably on an upright chair and commence rhythmic breathing for four to six rounds. I behold thy beauty every day. With life, through love of thee. That I may receive it and may live by it. Pause before beginning the invocation. Visualize each word as you utter it. Breathe it into life, invest it with passion. Each is a rhythmic element combining to form a powerful symphony. Imbue your call with such beauty that the Goddess cannot help but to respond. Hail to thee, O Isis! Hail the mother of Horus! Bestow upon me the gift of smell. I drink in this fragrance and am dizzy with delight. Thou who sits upon a throne of royal purple. Hail to thee, O Isis. I tremble at your presence. vulture goddess slowly flaps her wings above me. Isis, allow me to look upon you, O gracious one. And your face shines like a thousand moons. Your beauteous face radiates love for me. You inspire comfort, communion, and harmony. My fears fall away this very instant. Hail to thee, O child of the goddess. Thou who wears the side lock of youth. You control a red serpent. Is it the knowledge you control? Or the power you have over the snake? O that ye may impart the knowledge of this power to me. Nuk kshesev neseni t’a pa ma-ehti. I drive back disaster: sail forth the right and truth. Speak to me of thyself, so that I may learn more of thee. Open my ears so that I may hear your sacred voice. "I am she who triumphed over death to bring my beloved husband-brother back to life. I am mistress of the sun and daughter of the lord gods. I am wife of a king and carried the young god within me to this sacred place and gave birth to him. 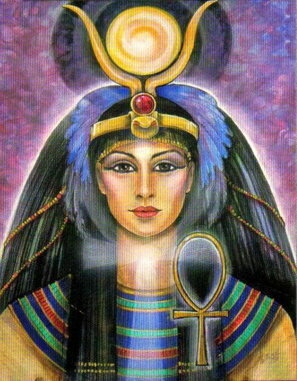 I am Isis, great mother of gods, and Queen of the Mammisi. Look upon me as I truly am, unfettered by your hopes and fantasies. I have lingered in the shadows watching you shape and un-shape me, age after age, an empty image not worthy of my name. "Remember this, my child. Through me shall you find the greater mysteries of life. I speak of many things that are known and unknown, my breath to your breath, my heart to your heart. Take up the goblet and drink heartily the elixir of life. Feel the serpent of knowledge as it entwines itself around your arm." At this stage, you may want to take some personal time with Isis for meditation, quiet introspection, conversation, or whatever you need to help build and foster your relationship with Her. The important part of this stage is to open your heart to Her, and enjoyHer presence. In perfect love and perfect trust I drink. Let this serve as a pathway to open my psyche. Let my soul be stirred. Who has made it holy by her presence. May the wave of pure harmony wash over me. "If the essence and perfection of all good are comprehended in the Goddess, and if I adhere to a more excellent nature, I will always obtain a union with her, the contemplation of truth, and the possession of intellect. For a knowledge of all the gods is accompanied with a conversion to, and knowledge of, myself." Stand silently, and think about what you have uttered and what has been said to you. Think of what you have been privileged to see. Close the shrine, if you have an enclosed shrine. "I shall always remember that all deities are true and valid emanations of the Supreme One, and will not allow myself to become so obsessed with one aspect that I denigrate others, for this is not true love of Deity." From Invoking the Egyptian Gods, by Judith Page and Ken Biles.